The Nielsen family is very involved in racing. Not only does Brandon compete against his brother, Cody, but the brothers hold the No. 1 and 2 spots in Hobby Stock points at the Clay County Fair Speedway. Their dad owns the shop where the sons work on their cars and “is pretty much the crew chief for both cars.” Mom is the videographer for each race while uncles cheer on both competitors. Brandon’s kids often go; he hopes that it’s to cheer him on, but the concession stand might win their hearts some nights. The family often uses it as a way to get together. With much of the support system for the racing teams being family, grandparents get to see grandkids; uncles get to see nephews and nieces; and brothers spend time doing something everyone enjoys. The brothers have raced all over the areas of northwest and central Iowa and southwest Minnesota. Nielsen says there is “still nothing cooler than winning in front of the hometown”. 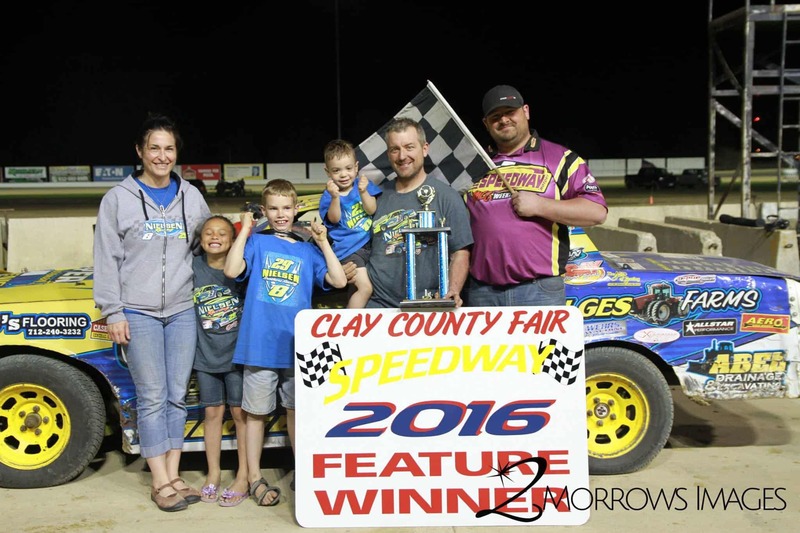 Brandon started his 2016 season at the CCF Speedway with a win. His car, T8, is named after his son, who was in the stands that night watching alongside the rest of the Nielsen family. His wife, Andrea, and family cheer him on often and contribute to his favorite part about racing: the time spent with family, friends, and the competition. Racing well forces a driver to find the right combination for his or her driving style. Hobby Stock cars are not allowed to be modified much. But, “the hardest part about racing is the time invested,” he says. For the last few years, he has raced three times a week. Nielsen said, “It’s like a second job.” Often throughout the week, he will put his kids to bed and then work on the car before the next race. Hobby Stock racing is “the most bang for your buck class in racing,” the brothers say. Most parts are more affordable and reliable for the cost, including the crate motor option, he says. The front tires last almost all year while the rear tires get a few races on them before they need replaced. While Hobby Stocks does not always have the highest winnings, the parts are less expensive, making it a winning combination for the Nielsen team.